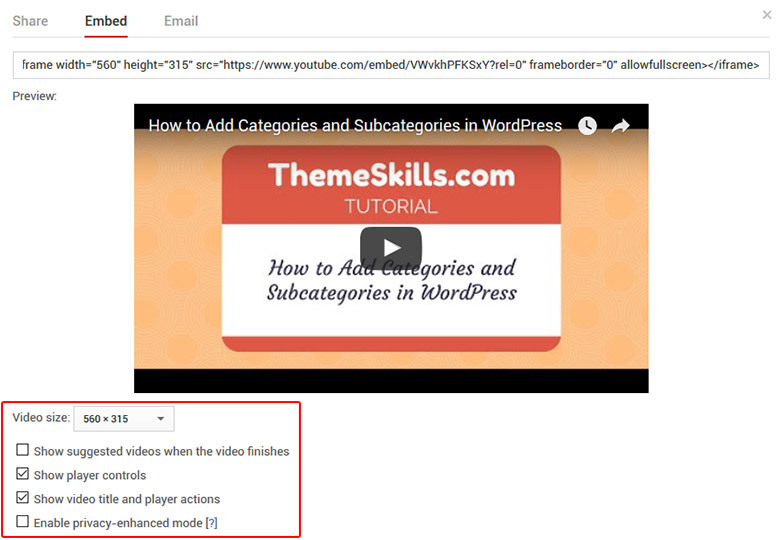 The simplest way to add a YouTube video in WordPress is by simply copying and pasting the URL in a page or post, and, if your theme is responsive, the YouTube video will automatically become responsive too and properly scaled down on mobile devices. I’ve created a post and simply pasted a YouTube link. Now let’s see if it’s responsive. As you can see, as I shrink my browser, all the content, including the YouTube video, gets scaled down, becoming responsive. But what if you want to embed a YouTube video using an iframe, thing which allows you to choose between several options, like setting the size of the video, switching player controls on or off, and other such options that you can see below. Now, some themes are optimized for displaying responsive iframes, but many aren’t, so your embedded video will not scale down on mobile devices; instead, it will just be cropped off, as you can see below. Fortunately, there’s an awesome CSS code that you can implement to fix this issue. I think it’s better than to install another plugin that might bloat your website some more. The fewer plugins you have, the better. 1. 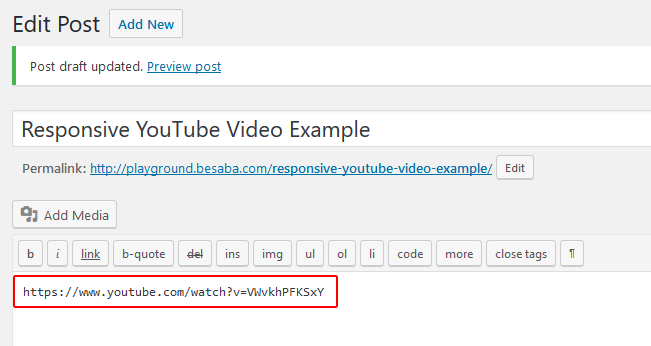 Go to your desired YouTube video, press “Share’, then click on the “Embed” tab and copy the iframe code. The video options you select will appear in this code. 2. Paste it inside a post and wrap it in a div tag with a “class”. 3. Now you have to add the below CSS code. Here’s how to add CSS in WordPress. That’s it! 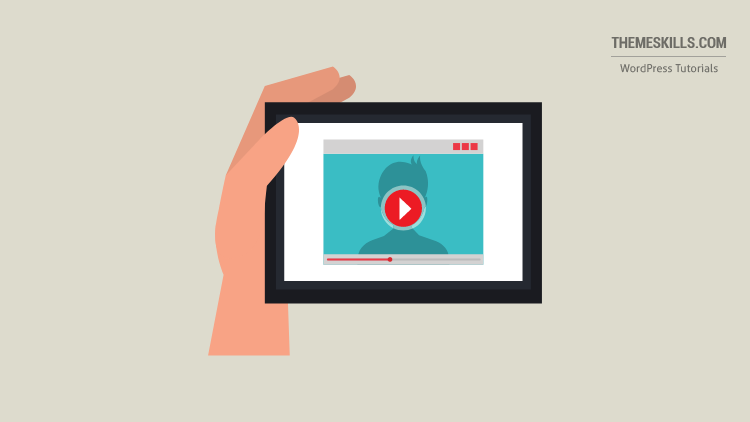 Now your embedded YouTube video should be responsive. Now every time you add an embed code into a post, make sure to wrap it in the div tag: <div class="youtube-responsive-container"><iframe ...></iframe></div>. You can change the “class” name, though, but make sure you always use the same one. You don’t have to add the CSS code again, just the div tag around the iframe code. If you have questions or thoughts, please leave a comment, contact us, or message us on Facebook. Thanks Sir for posting this awesome information. I use hueman theme in which my video is not responsive but after trying your trick my video will be responsive. I went to take a look, but there’s no video, just white space where the video was supposed to appear. I checked the code and the IFrame is there, but no video. Checked with two different browsers. Please this didnt work for me, what do i do ? Now my blog is worked with beautiful Youtube Video and very responsive. Thanks! First I had a letter box with small black rows above and below, but I changed padding-top to 0px, and then the letterbox was gone. I’d love to set a maximum size for a laptop browser though as now it is full width. Which is nice on mobile, but a bit big on a laptop. But it will do. Thanks! in my mobile responsive not working what i do? Sorry, but you’ll have to be more specific. it works for website, but not on the mobile/smart phone. If it doesn’t work, it’s either added wrong or something is preventing the code to work properly, like your theme or another plugin. Thank you very much. I was looking for how to get a responsive video on my website. I’m happy it worked! Thanks for letting me and others know! Did the same thing but with the div code now, the page has no video, just the embed code and tag as text. I have a problem with this code. The video fits to maximum screen size and as i do not have a sidebar for my site and the video is extremely large in my laptop, almost close to fullscreen, which looks bad cause the video is not that good. Making a change in video size in the embed code doesnt make any difference in the real page, it only makes a change in the page editing visual part. How can you fit to max screen size for mobile and fit it to 60% (width and height) for laptops?? Hello! Glad to see you solved the other problems. Step 1 – Leave the code that you already added to make the video responsive, but replace 100% with 60% for width and height. This will shrink the video to 60% for all devices. Follow step 2 to make it full-width back on mobile devices only. Clear your page/site and browser cache. You can change the breaking point (768px) if you want. This will make the video full-width on tablets too. If you want it full-width only on smartphones, then you could add a smaller breaking point, such as 640px. Use tools like Responsinator and MobileTest to check things out. You’ll need some custom PHP coding for that, I think. Most themes have that feature built-in but some don’t. Hello, I embedded a you tube video in one of my wordpress.org posts, I simply copied the url and pasted in a box of the Gutenberg editor, it shows perfectly fine on desktop, but it doesn’t show at all on mobile. what might be the issue? I already tried, share, embedded and copy the iframe code and then paste it in a box of the Gutenberg editor, it works on desktop but still nothing on mobile. Did you add the YouTube video in Gutenberg’s “Embeds” block, which is designed for embeds? I tested it in a default WordPress theme and it works fine on both desktop and mobile. If you did use the Embeds block, then it might be a conflict somewhere, most likely between Gutenberg and your theme. Few themes are Gutenberg-ready. My goodness this is exactly what I needed! The lack of responsiveness on the mobile version of my website was driving me insane…thank you! Thanks so much! This is the ONLY article that actually helped me solve my problem. WordPress really needs to address this bug… I mean why have auto embed from a youtube link but make it non responsive? It just doesn’t make sense. Come on wordpress! Making iframes responsive is actually a theme responsibility, at least for the time being. Some theme developers handle this, some don’t, unfortunately. Works like magic. Unfortunatley, I had to search severally and test so many incorrect and difficult ‘solutions’ before I finally land on your page. thanks so much. That’s great! I’m happy that my post helped you out! In one of my website, the responsive CSS code is not working. I am doing it in the proper way but no result. I am using the WPEX Blogger theme. Is the theme causing this problem? Or what else should I do? Please suggest. If you’re saying that the code doesn’t work only on one of your sites, then there’s definitely something there that prevents it from working. See if a plugin might be the cause. The simplest way to check this is to disable them all at once and clear the cache. Create a backup first. If nothing works, then the theme’s coding may prevent this custom code to take effect. You’re most welcome! I’m happy to see that my post solved your issue! Awesome! I’m glad it worked for you! Thanks for letting me know! My issue is that while this worked like a charm on mobile it has made all the videos on Desktop huge and left aligned and I can’t figure out why. It’s pretty hard to spot the issue without a more in-depth investigation. It could be theme related. This should make the code apply only on tablets and smartphones. Thanks I’ll try that now! You Rock – that totally fixed my problem. You can also just edit the code so it reads: width=”70%” and this will make it responsive! It may not do the trick on some themes. Also, making it 70% (or anything other than 100%) will make it look like it’s aligned to the left unless you center it somehow. The height also needs to be set to keep a proper aspect ratio, and setting both width and height to 100% directly in the embed code won’t work properly.